In the Fury Mini’s program, we teach core skills formatted in a FUN, safe and loosely-structured, non-league environment where your child learns eye/foot and eye/hand coordination, listening skills, following directions, motor-skills, balance, teamwork and so much more! Our success is made possible by our fantastic Coaches and parent-facilitated involvement. Each session will last for 45 minutes where will incorporate dribbling and ball control. 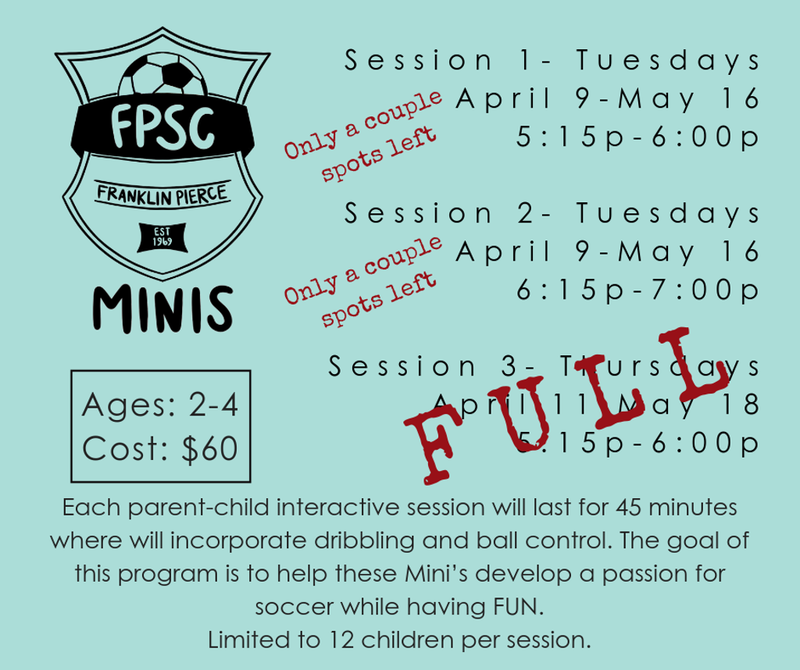 The goal of this program is to help these Mini’s develop a passion for soccer while having FUN. Cost: $60 - Each 6 week sessions includes a ball and a t-shirt for the child and one adult. Limited space available. Each session will only have 12 opening. If you have any registration questions please contact Sean Tinder. This is the player registration cost only. MICRO - T-Shirt is provided. MOD - adidas Jersey is provided. REC - adidas Jersey and Shorts are provided. All jerseys MUST have FPSC Logo on the front and jersey number on the back. Anyone using alternate jerseys must get board approval. Club colors are red, black or gray. Franklin Pierce Soccer Club (FPSC) offers scholarships to families for whom organized soccer would not otherwise be possible. FPSC has limited scholarships available and will accept only scholarship applicants that meet the criteria and have all supporting documentation. The scholarship application must be fully completed by the applicant. Incomplete applications will not be considered. A separate application form must be completed for each child. Application deadline is March 31st Boy HS Fury (U16-U19) and June 30th all other ages. Sponsors play a vital role in demonstrating their support of the Franklin Pierce Soccer Program. Please use the following link if you would like to donate to the Munden-Rivers Scholarship Fund.